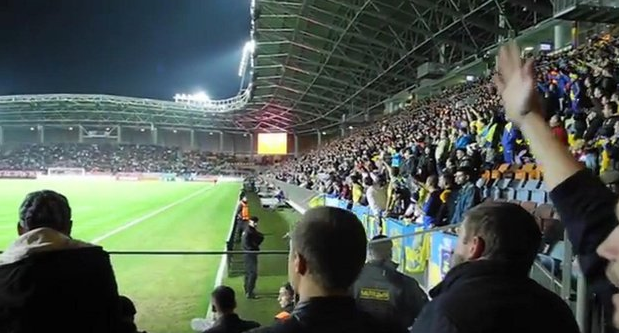 Just over 100 football fans were detained during the Belarus vs Ukraine Euro 2016 qualifier for chanting anti-Putin song. Local media reports suggest that almost the entire stadium joined in to sing a well-known song that insults Russian President Vladimir Putin. 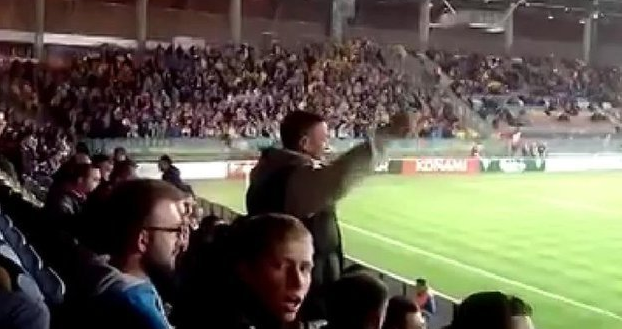 Both sets of fans joined in a very loud and boisterous rendition of a song that has become a battle cry against what is perceived as Putin’s occupation of Ukraine. The two sets of fans showed extreme solidarity with each other, almost setting the Euro 2016 qualifier game into the backdrop of what was indeed a political display against Putin and Russia by both nations’ fans. Belarusian fans showed their solidarity to Ukrainian fans by chanting Slava Ukrayini (Glory to Ukraine) and the Ukrainians returned the gesture by chanting Zhyve Belarus (Long Live Belarus). Once the game ended 100 Ukrainian and 30 Belarusian fans were taken and held at a local KGB office with the charge of using obscene language in public. Local reports suggest that the Ukrainian fans will be deported while the Belarusians could be taken to court and even convicted which would see them serve five days in jail. This is not new when it comes to Russian clamp down on foul language. In April of this year, parliament passed a bill that bans cursing in films, music and other forms of art. It may not be long before the word Putin is considered a banned word by the way things are developing. You can call it what you will, I call it censorship.